Asian Business School / Campus Updates / Students of Asian Education Group participate in #IPledgeMyVote for a better India campaign! Students of Asian Education Group participate in #IPledgeMyVote for a better India campaign! 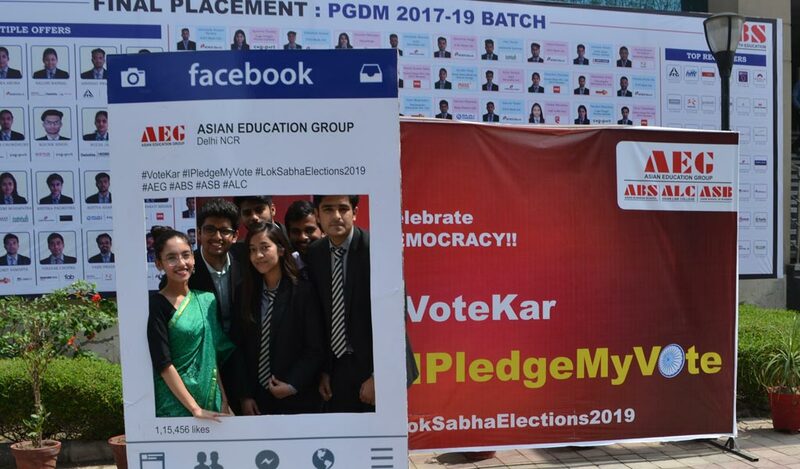 In the wake of the upcoming Lok Sabha Elections 2019, Asian Education Group (AEG) has launched a campaign at all its campuses across Noida to create an awareness about the importance of voting for its student communities by the name of #IPledgeMyVote for a better India. Students belonging to all its three constituent group colleges – namely, Asian Business School (ABS), Asian School of Business (ASB) & Asian Law College (ALC) – are actively participating in this great nationalistic responsibility. Steeped in the seed thought that “Voting is not just your RIGHT; It is also your RESPONSIBILITY!”, the campaign calls upon all conscientious citizens of India to not-to-forget their cardinal responsibility of exercising their franchise in choosing their best representatives for the most important ‘House’ of the supreme legislative body of the Republic of India – viz. the Lok Sabha (or the ‘Lower House’) within our Parliament of India. Celebrating the beauty and essence of “Democracy” as no-less-than a festive occasion, the main ingredient of the campaign constitutes of students participating in a series of placard displays carrying relevant messages like “I Pledge My VOTE for a Better INDIA”, “I Pledge My VOTE for a Corruption Free INDIA”, “I Pledge My VOTE for a Strong INDIA”, “I Pledge My VOTE for Space Power INDIA”, “I Pledge My VOTE for Terrorism Free INDIA”, “I Pledge My VOTE for Global Leader INDIA”, and “I Pledge My VOTE for Super Power INDIA”. The campaign is garnering a lot of interest among the PGDM students of ABS, BBA/BCA students of ASB, and BA-LL.B/LL.B students of ALC and augurs well for the Young India Voters, which is going to be one of the deciding factor in the outcome of this Lok Sabha Elections 2019 with around 10 crore 1st Time Voters in 2019!